Belt and Pulley Drive for Lawnmower engines etc. From now on it gets a little complicated. You will have to be patient and re-read this page over and over. I'm taking it that you are decided on choosing a v-belt for your drive. Firstly the materials you will need are firstly the smallest V-pulley you can lay your hands on. Metal ones are best as they can be welded to the engine shaft.. Secondly you will need a large V-pulley about 5 times the diameter of your smallest V-pulley. Thirdly you will need a suitable V-belt to fit the V-pulleys, this should be fairly long, around 1 meter long. You should be able to get these materials new from a good car dealer. My suggestion is old washmachines and everything with V-pulleys in it, eg. petrol pumps!!. Flat Belts and Splinned Pulleys are un-usable in this situation. You can get a rough idea of what's happening from the above diagram. What you must do is to secure the small V-Pulley onto the lawnmower eingine shaft. If you are lucky and if you have a metal pulley wheel, then it's relatively simple to weld it onto the engine shaft, making sure there are no wobble and that the pulley is concentric on the engine shaft. However if you are not so fortunate you will have to try and bolt the pulley wheel to the engine shaft. The way I managed it on my Briggs and Stratton was to cut out a groove out of the pulley wheel which would match up with the cutting blade attachment. The Problem was that the bolt on it's own did not prevent the Pulley wheel from spinning. With the groove taken out of it, the power of the engine was directly connected to the pulley wheel and the bolt is just to hold the pulley wheel up in the groove. This will have to be done in the case of aluminium pulley wheels. Of course it's at your own discression how you work it. Another method of fixing the Aluminium pulley wheel to the engine is to do as done in the picture below. The trick here is that as the engine turns it will tighten the bolt as the pulley is driving the belt and rear axle. It reaches a point where it will no longer tighten any more and drives with maximum power. Hopefully this will assist, and solve your problems. The hardest part is fixing the pulley wheel to the engine. Again for fixing the large pulley to the rear axle, then go to this link for sprocket mountings. <Sprocket and Pulley Mountings> It is the same procedure for the pulley wheel as it is for the sprocket. All you have to do then is to mount the engine on some sort of frame, rasing the engine up a bit, preventing the engine shaft from hiting the ground!. What you do then is to put the drive V-belt onto the two pulley wheels and move the engine forward untill the belt is fairly tight, fix the engine at that point, and then you are motering. If you find that your kart is going backwards, don't worry, just take off the drive belt and put it on the two pulleys a different way. The best way is to mess around with the belt and it will go forwards. 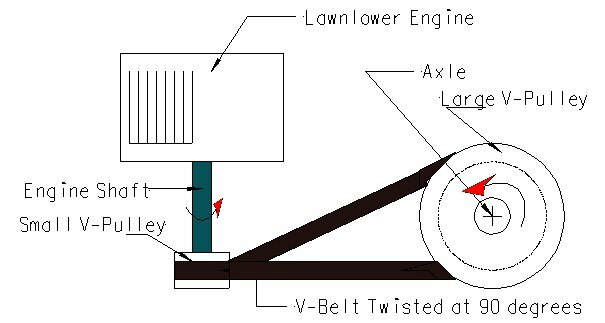 I'll try to explain, with the belt on the axle and the engine, (driving the kart in reverse) take it off the engine/ driving pulley, now twist the belt by 90 degrees and put it back onto the engine/ driving pulley. Don't go changing anything. It's a crude set-up but it works, a fair bit. A bit of theory on belt drives. 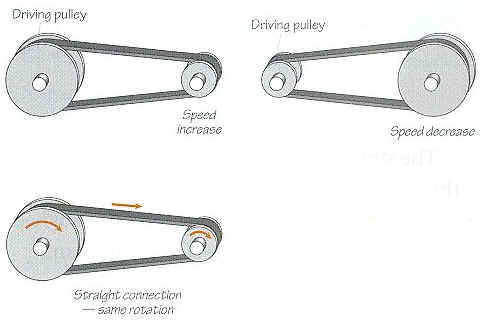 The same principles are used for sprockets in relatation to the speed redustion/ increase.